Sustainable investments are good for you and the wider world – it’s a win-win situation! Good news! Ethical and sustainable investments are on the rise, and ethical funds have been outperforming their mainstream counterparts – 19 out of 21 UK ethical equity funds had outperformed the FTSE 100 over the past year. 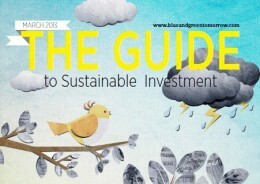 Have a look at Blue & Green Tomorrow’s Guide to Sustainable Investment. Inside the guide, you will find exclusive interviews with some of the sustainable investment industry’s key players, as well as insight into some of the most popular investment strategies and funds. It makes good sense to ensure that your money works for both you and the world around you so make 2014 the year to start being a more conscious investor.